Dress For Success™ Foyle – Northern Ireland, a new local affiliate of the international not-for-profit organisation, opened its first Northern Ireland branch in L’Derry on 18th January 2018. The new offices and boutique space are located at Ashleywood House, 15 Ardmore Road, L’Derry. Since suiting the first client in New York in 1997, Dress for Success has served more than 1 million women internationally by providing them with business-appropriate clothing, mentoring and professional development programmes. This brand-new affiliate will join more than 152 others around the globe. Women come to Dress for Success ™Foyle by referral after having completed job training programmes offered by local social service agencies and non-profit organisations. Every woman who is referred to Dress For Success™ will get a session with a trained stylist, who will help them choose the perfect outfit for the interview. Everything from the suit to the shoes, handbags and accessories will be provided free of charge. But Dress for Success™ isn’t only about providing clothes; women are also offered guidance with CVs and interview preparation. The service is also open to school leavers, graduates and young people who are going to interviews and would like support with presenting themselves and attending interviews. 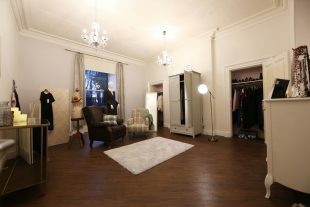 Dress for Success™ Foyle was established in L’ Derry by Foyle Women’s Aid, supported by retailer Marks & Spencer through donation of professional attire, stylist training and the set-up of the boutique. “Our mission is to empower women to achieve economic independence by providing a network of support, professional attire and development tools to help women thrive in work and life,” a spokesperson for Foyle Women’s Aid explained. The knowledge that she can actively define her life, the direction she takes and what success means to her. In 1996, second-year Law student Nancy Lublin received a $5000 inheritance from her great-grandfather and decided to turn this gift into one that would keep on giving. She teamed up with three nuns in her area and, identifying a crucial need that was not being filled, founded Dress for Success™ in the basement of a church in Manhattan that same year. From that original basement boutique, the mission for Dress for Success™ spread over all of North America and then across the globe, demonstrating that achieving economic independence is a challenge that all women face regardless of their location, language, customs or culture. Just two years later, Dress for Success™ could be found in 22 different cities in the US and, in 1999, established its first international location. Today, there are more than 152 Dress for Success affiliates in 28 countries – with those numbers increasing every year. 0 responses on "Dress for Success Foyle - Northern Ireland"